Oil’s price managed to move above the resistance zone, and closed above the 64 level on Apr 8 and 10. Sliding volumes showed lack of follow-up buying. Oil’s price has drifted down inside the resistance zone (between 60-62). The impending ‘golden cross’ of the 50 day EMA above the 200 day EMA will technically confirm a return to a bull market. Expect oil’s price to move higher after a bit of consolidation or correction. Daily technical indicators are correcting overbought conditions. 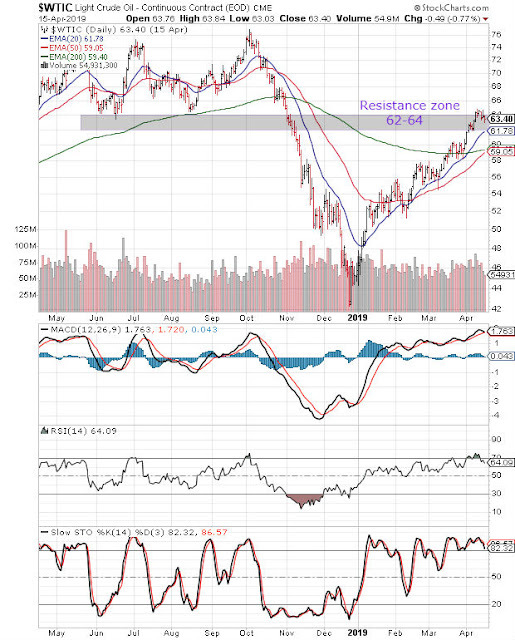 MACD is about to cross below its rising signal line in overbought zone. RSI has dropped from its overbought zone. Slow stochastic has fallen to the edge of its overbought zone. On longer term weekly chart (not shown), oil’s price closed above its three weekly EMAs in long-term bull territory for the third week in a row. Weekly technical indicators are looking bullish. MACD is rising above its signal line in bullish zone. RSI is moving sideways above its 50% level. Slow stochastic remains well inside its overbought zone, and can trigger some more correction or consolidation. The daily bar chart pattern of Brent Crude Oil entered the resistance zone between 70-72 as expected, but has been consolidating sideways after failing to cross above the 72 level. Oil’s price is trading above its three EMAs in bull territory. The impending ‘golden cross’ of the 50 day EMA above the 200 day EMA will technically confirm a return to a bull market. Daily technical indicators are looking bullish and overbought. MACD is rising above its sliding signal line in overbought zone. 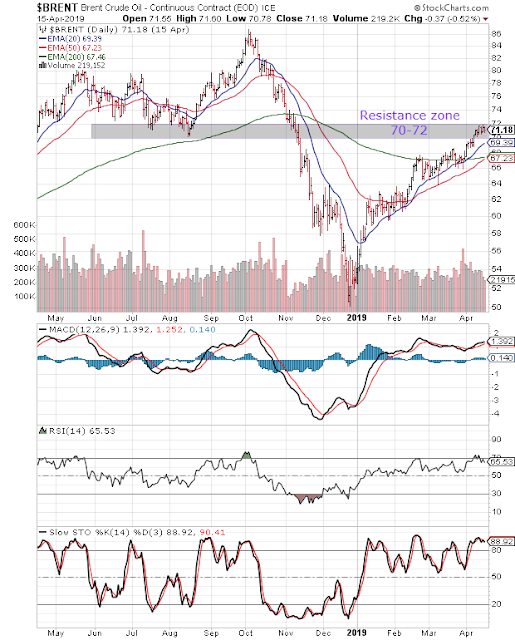 RSI has dropped down from its overbought zone. Slow stochastic is inside its overbought zone. Some more consolidation is possible before oil’s price makes an attempt to move above the resistance zone. On longer term weekly chart (not shown), oil’s price closed above its three weekly EMAs in long-term bull territory for the third straight week. Weekly MACD and RSI are in bullish zones. Slow stochastic is well inside its overbought zone, and can trigger some more consolidation or correction.